Entry form including short outline. IAE registration fee is 1,000 Euros for each entry (a candidate can apply with multiple proposals). The jury is composed of at least 5 members. Please submit your 2017 Awards for Excellence entry online. Your application is not going to be considered eligible if the registration fee has not been paid. Due to request from ISOCARP members and great interest to submit for this prestigious award, the deadline has been extended to 15 August. 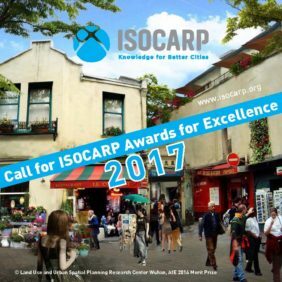 Grand Award: one year free membership to ISOCARP, free entrance to the congress, official ISOCARP certification of the award and dissemination of the project through the ISOCARP website, social media and newsletter. Merit Award: free entrance to the congress, official ISOCARP certification of the award and dissemination of the project through the ISOCARP website, social media and newsletter.